Scripture and Destroy the Gospel Message? While both Young Earth Creationists (YECs) and Old Earth Creationists (OECs) believe God created the universe, they disagree on whenGod’s creative works took place and how long God took to complete creation. YECs adamantly contend a plain reading of Genesis requires the view that God created the universe approximately 6,000 years ago in six consecutive 24-hour days (more>>). Old Earth Creationists (OECs) confidently maintain that the ancient Hebrew language Genesis was originally written in does not require such a view and they resolutely assert an old earth is consistent with the teachings of Scripture. YECs offer several theological reasons for opposing old earth creationism (more>>). One of the primary reasons is because all old earth views presume God permitted death to occur before sin entered the world. Since YECs believe Scripture teaches all death is a consequence of man’s sin, they insist no death (even the death of animals) could have occurred before the Fall. From their perspective, any view of creation which permits death to have occurred before Adam and Eve sinned compromises the clear teaching of Scripture and, ultimately, destroys the gospel message. This article summarizes the Scriptural bases YEC’s rely on in asserting these positions as well as the responses of OECs. Issue: Do Old Earth Creation (OEC) views compromise the truth revealed in Scripture and, ultimately, destroy the gospelmessage by teaching God allowed animals to die before sin entered the world? Young Earth Creationist (YEC) View: Yes. Scripture teaches all death is the consequence of man’s sin and is the reason Christ had to die on the cross. OEC views compromise Scripture and, ultimately, destroy the gospel message by teaching animals died before sin entered the world at the time of the Fall. Old Earth Creationist (OEC) View: No. Man’s sin caused man’s separation from God resulting in man’s spiritual death. While all men sin, animals have no moral standards and are neither innocent nor guilty of sin. Scripture clearly teaches Christ died on the cross to make a way of salvation for man but nothing in Scripture indicates animals died because of their sin or that Christ died for the salvation of animals. Therefore, the death of animals before the Fall in no way diminishes Christ’s work of atonement for man’s sin on the cross. Because YECs fervently believe OEC views are clearly inconsistent with Scripture, many YECs accuse those who promote old earth views (e.g., the Day-Age View more>>, the Intermittent-Day View more>>, the Literary Framework View more>>) of choosing to reinterpret the plain and literal meaning of Scripture to accommodate secular science and, particularly, evolutionary theory. In doing so, YECs allege OECs have elevated the science of fallible human beings over the infallible and inerrant word of God. In the view of many OECs, such as Hugh Ross (www.reasons.org) who holds a Day-Age View more>> and Robert Newman(www.newmanlib.ibri.org) who holds to the Intermittent-Day View more>>, since all truth is God’s truth, when accurately interpreted and translated, the truth revealed in the God’s record of Scripture will always agree with the truth revealed in God’s record of nature. However, even though the record of Scripture and the record of nature both reveal God’s perfect truth, both records are subject to misinterpretation and misapplication by fallible human beings. Seeking to correctly understand Scripture by considering what scientists have learned from God’s record of nature. Satan was the first creature to sin when he rebelled against God in heaven (Isaiah 14:13-14). Thereafter, Satan infected the human race with sin by persuading Adam and Eve to rebel against God in the Garden of Eden (Gen. 3:1-13). Romans 5:12 and 1 Corinthians 15:21-23 are referring to the spiritual death of men (who are sinners), not animals who are neither “innocent” nor “guilty” of sin because they are not spiritual moral beings made in God’s image. Nothing in Scripture indicates animals are capable of sinning or that Christ died for the salvation of animals. 1 Corinthians 15:21-23 only teaches that just as Adam brought death to men, Christ brings life to men. Although the Bible teaches there is no remission of sin without the shedding of blood (e.g., Hebrews 9:22), it does not necessarily follow that all shed blood is for the remission of sin. Without question, the YEC vs. OEC debate has been, and will continue to be, a passionately contested issue within the Christian community. People on both sides of the issue steadfastly believe they have solid scriptural and scientific grounds for their beliefs. That fact is unlikely to change and we will continue to wrestle with and argue over the theological and scientific issues involved in the age of the earth debate. 1 Peter 3:15-16: 15 …. but in your hearts honor Christ the Lord as holy, always being prepared to make a defense to anyone who asks you for a reason for the hope that is in you; yet do it with gentleness and respect, 16 having a good conscience, so that, when you are slandered, those who revile your good behavior in Christ may be put to shame. Galatians 5:22-26: 22 But the fruit of the Spirit is love, joy, peace, patience, kindness, goodness, faithfulness, 23 gentleness, self-control…. 25 If we live by the Spirit, let us also keep in step with the Spirit. 26 Let us not become conceited, provoking one another, envying one another. Ephesians 4:1-31: “…[W]alk in a manner worthy of the calling to which you have been called, 2 with all humility and gentleness, with patience, bearing with one another in love, 3 eager to maintain the unity of the Spirit in the bond of peace…. [S]peaking the truth in love, we are to grow up in every way into him who is the head, into Christ, …. 31 Let all bitterness and wrath and anger and clamor and slander be put away from you, along with all malice. 32 Be kind to one another, tenderhearted, forgiving one another, as God in Christforgave you. 1 Peter 4:8-11: 8 Above all, love each other deeply, because love covers a multitude of sin,…. 11 If anyone speaks, they should do so as one who speaks the very words of God. If anyone serves, they should do so with the strength God provides, so that in all thingsGod may be praised through Jesus Christ. 2 Timothy 2:15: 15 Do your best to present yourself to God as one approved, a worker who does not need to be ashamed and who correctly handles the word of truth. His will, working in us what is pleasing in His sight, through Jesus Christ. DO YOU BELIEVE GOD CREATED THE UNIVERSE? DO YOU BELIEVE IN A YOUNG EARTH OR AN OLD EARTH? WHY DO YOU BELIEVE WHAT YOU BELIEVE? Browse through the articles on the FactsandFaith.com website and consider some of the REASONS Christian philosophers and theologians give for contending that belief in the biblical Creator is a very rational belief; if not the most rational belief possible, and why YECs and OECs hold different views regarding when God created and how long God created. Visit Facts & Faith on Facebook and “Like” and “Share” this ONE MINUTE BRIEF with others so they may consider the reasons Christians have for believing in the God of the Bible. Have a good and prosperous day. Let your light shine before men so they notice your moral excellence as well as your good and noble deeds and, thereby, recognize and glorify your Father in heaven! 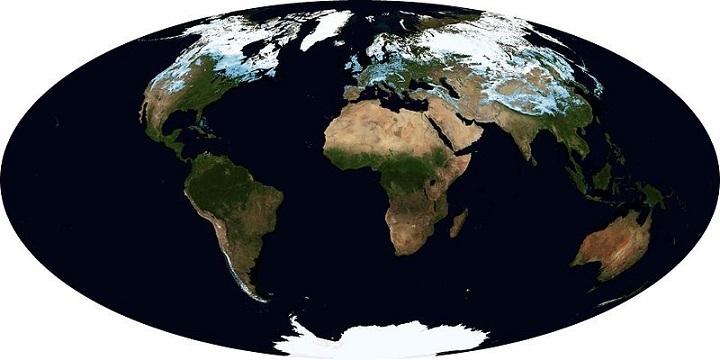 Slideshow Photo: This image of Planet Earth was downloaded from Wikimedia.org which states the image is in the public domain because it was solely created by NASA.